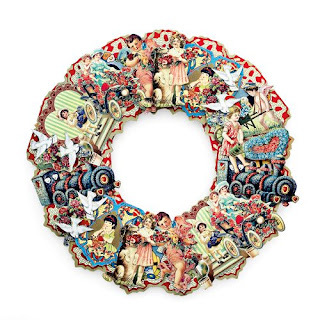 Early in January I found this cute Valentine wreath on the Williams Sonoma website. But I decided I could make one I like even better (and save myself a little $$). So I set to work trying to find some vintage Valentine printables on-line. I had no luck until a couple of days ago when Heather Bullard posted some free vintage Valentines. They are so cute! So I printed them up for my wreath. I didn't want to use as many Valentine's as they used in the WS wreath because I thought it was a bit "busy" for my taste. So I just used one of each. They made a circle just the size of one of my dinner plates. So I traced one out on some cardboard and used a small bowl for the inner circle. I cut out the wreath shape, and simply used stick glue to adhere the cards to my cardboard wreath. It was very cute, but I decided that it needed a little something more, so I used some Mod Podge and glitter...of course! Added a pretty little bit of ribbon and VOILA! I just love it! What a great idea! It turned out so cute. You make it sound so easy but the result is amazing. Adorable, I think you have inspired me to do one! I had seen that one at WS too but did not want to buy one. Think I will go copy some vintage cards I have to card stock and make one. I love it!! So darling, I will have to make this and put it up for next year!! What a great idea! I think I'm going to have to copy you! It's so cute. It turned out very nice and you saved a ton of money. How cute! That wreath is amazing and beautiful. Great job!!! So sweet & adorable! And I like yours much better than WS's - much less cluttered & you can enjoy each card! OH I LOVE IT!!! I'm getting busy right now!!! Thanks so much. Very cute. You're so creative. That is on my list of projects "to be done" and it almost Valentine's Day! It looks great and I need to get working on mine!!!! I like yours much better!! What a great idea. I love it when someone makes something that they could have simply bought. Saving some money and having fun at the same time is way better!! I love that...I have used vintage valentines in my decor but this is too cute. Thanks for the tip. Very cute! I love that idea. Thanks for posting the link. That is the cutest Valentine wreath!! Now I know what to do with my reproduction vintage valentines--thank you!! This is great. I bought some vintage valentine scrapbook paper and can add that to the ones from the link you posted. We made some ornaments out of the scrapbook paper too as Valentines. What a great wreath! It looks even better than the one at Williams Sonoma! You definitely win Best Copycat Award - and when they see yours they may be calling you for future projects! I have already visited the site and saved them. Thanks for the tip. The one with the black and white dog is my favorite... adorable. Okay, this is why I LOVE blogging! I made a copy of those valentines the other day because I thought they were so darn cute, but I had no idea of I was going to do with them! That wreath turned out cute! Thanks for sharing. LOVE IT! very unique and not too "valentine-y" for me:) thanks!! What an adorable wreath! I'm definitely going to try that one out :) Thanks for the directions! That's gorgeous! And I love that you used Heather's valentines, double awesome! Thanks so much for sharing this gorgeous project, I'll be linking. That seriously looks better than the one you could have spent gobs of money on. Oh my gosh! What a great idea. It's absolutely adorable. Love it!!! You are so creative!!! I love it! (Love your blog too.) Years ago I bought a HUGE bag (probably has a couple hundred) of unused vintage Valentines. I am soo going to make this wreath before I pack up the Valentine's decor. Thanks for the tut! I like yours even better than the catalog wreath! Wonderful job..and the best part is..you can say you made it yourself! I love your wreath! So cute. I follow Heather Bullard's blog, too and saw the images. I'm heading over there again and I want to make a wreath, too. And glitter, what can I say? I LOVE glitter. Thanks for sharing your great idea. Very cute craft idea. I am so bad, Valentines is the one day that I don't decorate for. You would think, I would, all of the red totally goes with my decor! I agree. I like your simpler version better. How clever. My blog is Kathy's Red Door Welcome and every month I change the way the door looks to suit each holiday. This is something I will try for next year. Love it, love it , love it!